This package is perfect for those who want to explore the main sights of Cambodia at a leisurely pace, allowing for plenty of time to get under the skin of the country. The trip start inbustling city of Siem Reap – home of amazing Angkor temples. Spend 12 days to explore the most famouse temples some of our favorite temples away from the tourists. Our journey continue to Cambodia ‘s capital- Phnompenh before going to countryside of Khmer people and end up on the laid-back coast in the southern of Cambodia, wake up the sleeing beauty of Kep and some islands near by. Price from: $890 - Book now! Welcome to Siem Reap, the provincial capital and gateway to the ancient Angkor Temples. Recognized a World Heritage Site by UNESCO, the Angkor Archaeological Park encompasses dozens of temple ruins including Bayon, Banteay Srei and the legendary Angkor Wat. Our guide and driver will meet you at the airport and take you to your hotel for check-in. In the afternoon, you are free to relax to recover from jetlag or explore Siem Reap’s Old Market on your own. Enjoy an entire day dedicated to discovering the mysterious Angkor temples. Wake up before dawn and transfer by a “tuk-tuk” to the magnificent Angkor Wat - the largest Khmer temple and finest example of Angkorian art and architecture. Dawn is the special and spiritual moment when it is much cooler and less crowded than the day time. After that return to hotel for late breakfast and a short break. Following the breakfast, drive out of town to visit silk farm where you will see how silk products are made. Then, going on a traditional wooden boat on the Tonle Sap which is the largest permanent fresh-water lake in South Asia. The lake flows into Tonle River, joining the Mekong in Phnom Penh. You will visit a “floating village” which moves from place to place according to the water level by boats that have been converted to look like houses. Enjoy the sunset over the lake before going back to the hotel where you will spend the rest of time on your own afterward. After breakfast at hotel, set out on the tour to visit the Angkor Thom, first with its imposing South Gate, topped with the four serenely smiling faces of Avalokiteshvara. The next your visit will be the Bayon Temple, the heart of Angkor Thom, followed by the Elephant Terrace and the Terrace of the Leper King. From there we proceed to jungle-entwined temple, Ta Prohm. After lunch of your own expense, you will be driven to Banteay Srei which is also one of the most beautiful temples; built in 967 AD by Jayavarman V's guru, it showcases the most exquisite, deep and complex carvings in all Khmer architecture. If time permits we continue visiting Preah Khan temple before returning to hotel in the afternoon. Enjoy breakfast at your hotel then transfer to Kampong Thom (147km, 2 hour drive), home to Cambodia’s most impressive group of pre-Angkorian monuments. Here we will visit the ancient temple complex, Sambor Prei Kuk, situated just north of Kampong Thom. The main temples are divided into three complexes, all dedicated to Shiva. Enjoy the serene atmosphere as you wander through these 7th century brick monuments, artfully scattered about the jungle. Say good bye to Kampong Thom and continue on the tour to Kampong Cham, where we will stop to visit the Wat Nokor Pagoda. This 11th century Mahayana Buddhist shrine is home to a large reclining Buddha as well as many carved Buddha images. 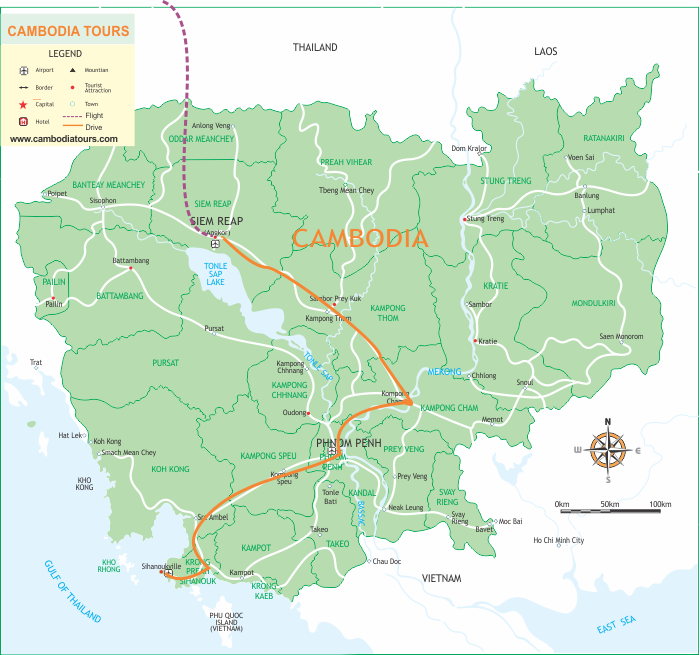 In the afternoon we continue on to Cambodia’s capital, Phnom Penh. Upon arrival, check in at the hotel then enjoy the rest of the evening at your leisure. Phnom Penh was founded in the 14th century and for a long time has been a vital trading hub at the confluence of three rivers: the Mekong, Tonle Sap, and Bassac. We start the day learning about the Khmer Rouge and Cambodia’s recent history on a guided tour of the Tuol Sleng Genocide Museum and the notorious Choeung Ek “Killing Fields.” Our cultural tour continues as we visit the National Museum— an introduction deeper into ancient Khmer art and civilization—and the Royal Palace, home to the royal family and the opulent silver pagoda. The journey southwards begins as we depart Phnom Penh and make our first stop at Phnom Chisor Temple, dating back from the 11th century. A 500 step path leads to the top of the hill from where we can enjoy spectacular view of the surrounding areas. Take a drive to the quiet town of Takeo before a quick jaunt via boat to Angkor Borei town, located just a few kilometers from the Vietnam border. There is a small museum that displays several reproductions of sculptures from the nearby ruins and few artifacts dating as far back as the 4th century. We continue our boat trip to visit a pre-Angkorian style temple of Phnom Da and a nearby temple of Asram Maharosei. The steep path over some big rocks makes Asram Maharosei different from other temples in Cambodia kingdom. Breakfast at hotel and then take a local boat ride to Rabbit Island which is a small beachy island about 20-40 minutes from Kep. With the relatively clear, warm waters, you may snorkel around the rocks. There’s no coral but lots of colorful fish. Late afternoon, transfer back to Kep. This morning, travel through delightful scenery of rice paddies, sugar palm trees, traditional wooden houses, and karst limestone outcrops to Kampot. On the way visit the cave of Phnom Chhnork. Inside the cave you will discover the remains of a 7th century brick temple. After this you will visit the caves of Phnom Sla’an, if you are feeling adventurous you can scramble through this cave until you magically appear into the sunlight on the top of the hill, being rewarded with perhaps some of the most beautiful views in Cambodia, with the traditional countryside stretching off into the Gulf of Thailand and its many islands. During the 1960’s Kampot was world famous for its aromatic pepper. A visit at pepper plantation will help you understand why, and you can observe the work of local community living there. Later this day continue driving to Sihanouk Ville and check in to your beach resort. Relax on a beach or take some water sports activities like kayaking, windsurfing or kitesurfing. Enjoy another free and relaxing day. After breakfast, you will be free until your transfer to the Phnom Penh international airport for your departure flight home. Bon voyage! I want to hire a van with 12 pasenggers for one day private tour around phnom penh on 27/3/2018. Thank you for your kind request. We sent you the best quotation via your email. If you need any further assistance for accommodation, guide, etc. around Cambodia, please let us know.